Stamp me a Bear Hug! A couple of weeks ago, I went to one of my favorite places to be, Paper Source, to participate in a paper workshop where a group of us got to play around with stamps, embossing, paper, envelopes, design hole-punches, corner punches, colors and more. It was the first time that I participated in a paper workshop, so I didn’t know what to expect. But, it was a fun three hours and we took home projects we made (cards, table numbers, envelopes we lined ourselves)…it’s a little bit like art camp for grown-ups. Check out the Paper Source blog for fun and artsy ideas. The staff is always great and they have a demonstration table with lots of fun projects. Wouldn’t this be a fun place to work? If you’ve visited Where the BlueBoots Go before, you’ll notice that I really like paper projects and both design and make note cards, thank you cards, congratulations cards, and more. You can see more on that here. I haven’t posted all the designs yet, but plan to when I have a few more moments. 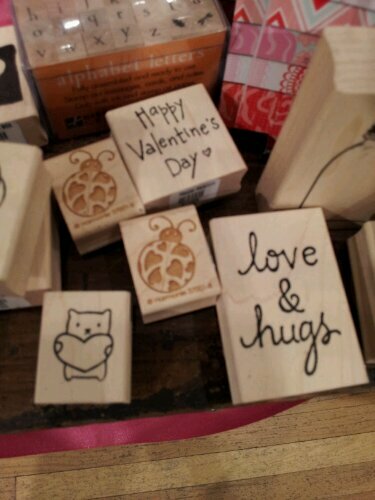 Seeing as how I have a soft spot in my heart for bears, I thought I would share perhaps THE most adorable stamp I have ever seen, pictured on left, and holding a heart. Tags: bear hugs, cute, cute stamps, favorite places, favorite stores, paper projects, Paper Source, Paper Source blog, paper workshops, stamps. Bookmark the permalink.